Description: With a striking southwestern Mission styled design emerges this stunning Santa Fe wall sconce. A charming aura projects from Creme Carrare Idalight with bold geometric styling. Complemented with an Antique Copper finished frame and hardware, the handcrafted wall fixture is ideal for ambient decorative lighting in a corridor or any room where you want to make a bold design statement. 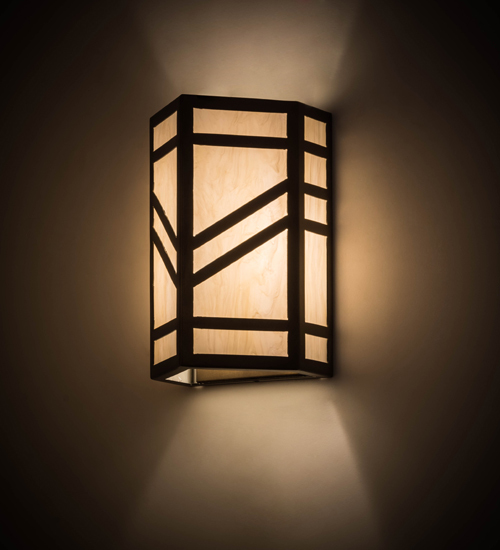 Handmade in the USA, this sconce is available in custom designs, colors and sizes, as well as with dimmable energy efficient lamping such as LED. The sconce is UL and cUL listed for damp and dry locations.